The Toronto Central Regional Cancer Program in partnership with Cancer Care Ontario invites you to promote breast and cervical cancer screening during Breast Cancer Awareness Month (BCAM) and Cervical Cancer Awareness Week (CCAW) this October. Breast cancer is the most common cancer in Ontario women but also has one of the highest survival rates. BCAM will focus on increasing screening participation among the 50 to 54 age group in particular, as this age group has the greatest number of screen-eligible women who have not received their next scheduled mammogram on time. One in eight women will be diagnosed with breast cancer in her lifetime. Regular breast cancer screening is important because it can find cancer early when it may be smaller and easier to treat. All women – regardless of age or risk factors – should be breast aware. This means knowing how your breasts normally look and feel so you can tell if there are changes. National Cervical Cancer Awareness Week is October 16th – October 20th. Cervical cancer can affect anyone with a cervix who has ever been sexually active. 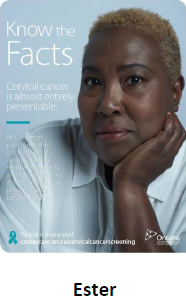 Cancer Care Ontario is encouraging anyone with a cervix between the ages of 21 and 69 who has been sexually active to be screened for cervical cancer. 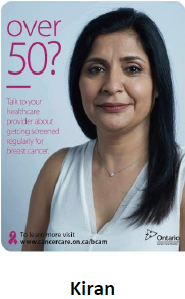 Most cervical cancers are found in women who have never been screened or have been screened less often than recommended by Ontario’s cervical screening guidelines. That’s why regular screening is so important. Talk to us today about getting screened for cervical cancer with a Pap test every three years.